A compelling and eloquent speaker and award-winning author, Shashi Tharoor, a former UN under-secretary-general and India’s nominee for the UN top job, will be in Colombo next week. It was a veto by the United States that ended Shashi Tharoor’s run for the top job at the United Nations. The former Indian Minister of State for Human Resource Development and Minister of State for External Affairs will be in Colombo next week to speak at the launch of Prime Minister Ranil Wickremesinghe’s biography - authored by Dinesh Weerakkody - at the BMICH. He will speak on ‘Sri Lanka’s balancing act between India and China’. Dr. Tharoor is currently an MP for the Indian National Congress and Chairman of the Parliamentary Standing Committee on External Affairs. Tharoor is an acclaimed writer, having authored 15 bestselling works of fiction and non-fiction since 1981, all of which are centered on India and its history, culture, film, politics, society, foreign policy and more. He is also the author of hundreds of columns and articles in publications such as The New York Times, The Washington Post, TIME, Newsweek and The Times of India. He was a contributing editor for Newsweek International for two years. From 2010-2012, he wrote a column in The Asian Age/Deccan Chronicle. 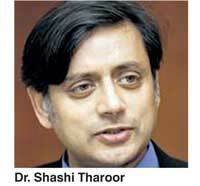 Tharoor is a globally-recognised speaker on India’s economics and politics, as well as on the freedom of the press, human rights, Indian culture and international affairs. In 1998 the World Economic Forum in Davos named him a ‘Global Leader of Tomorrow’. He is also a recipient of several awards that include a Commonwealth Writers’ Prize and the Pravasi Bharatiya Samman, India’s highest honour for overseas nationals. In 2012 the King of Spain awarded him the Encomienda de la Real Order Espanola de Carlos III. Among numerous other awards are one for ‘New Age Politician of the Year’ from NDTV, the Hakim Khan Sur Award for National Integration and the Priyadarshini Award for Excellence in Diplomacy.